Hi! I’m Penny. I’m here to help you ditch the overwhelm and get the tools you need to achieve total business freedom. Having started four (count ‘em!) businesses myself, I know first-hand how challenging it is when you’re in grow, grow, grow mode. You’re juggling trying to build your list, create new offers, and make sales all at the same time. And you’re doing all of it while serving your current clients. Without a road map or support. But who wants to just get by? And work every hour under the sun (and moon)?! That’s not your story any longer. Here’s your new mantra: “I am rich and relaxed.” Say it aloud with me. More time and more money. We all want both, right? I’m making a stand for having fabulous finances and fantastic fun times. No more burnout, no more overwhelm, and no more hamster-wheel lifestyle. AND you’re ready to do it in a way that’s balanced, blissful and full of freedom, then you’re in the right place. Want to take the shortcut to a Rich & Relaxed Business? Check out the best way to work with me. This one-to-one mentorship will give you the strategy, accountability and support to automate your sales, close more clients, and skyrocket your revenue — without turning into an exhausted zombie who works 24/7. Grab your favorite pair of sunnies, because you’re about to spend a lot less time plugged into your laptop and a lot more time living your #richandrelaxed life. Kylie is now fully booked - and has a waitlist! Jesse went from needing a bank loan to pay rent to having $12K months! Vision boards are all well and good, but we are women of action. Take the next step below. 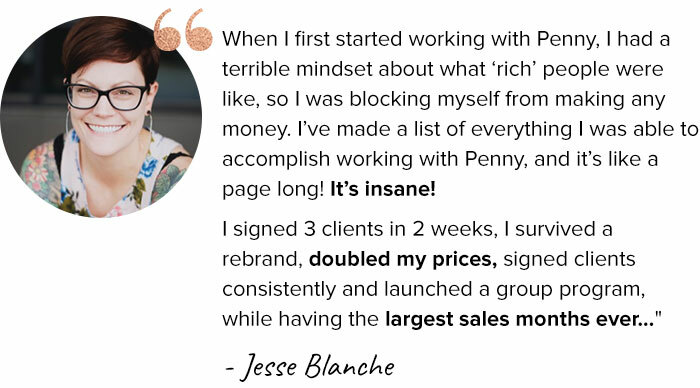 If you want to leapfrog to your income goal, fill your calendar with dream clients, and pave the way for more freedom, you’ll need a yes-worthy offer to make it happen. It’s my secret behind-the-scenes weapon for effortlessly booking more sales calls, landing more soulmate clients and ending feast and famine for good. Ready for a calendar full of hot leads and steady sales calls?